The Egyptian hang decor made from fibre glass makes a fabulous addition for any wall or Egyptian scene. The Egyptian hang decor is easy to hang on the wall. 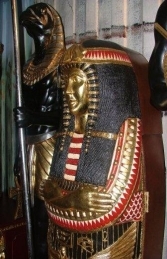 This item depicts one of the famous Pharaohs of ancient Egypt King Tutankhamen finished in a black and gold paint effect.